BRANCACCIO L., FIUME M.G., GRIMALDI M., RAPOLLA A. & ROMANO P.
In the Solofrana River lower valley a detailed gravimetric survey along three profiles was carried out. 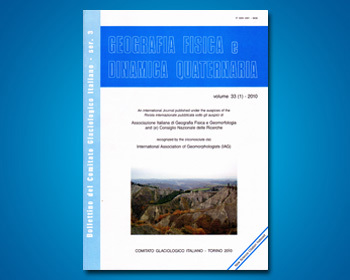 The gravimetric survey was integrated with the geomorphological analysis of the whole drainage basin and with the stratigraphic analysis of wells scattered in the alluvial plain of the Solofrana river. The gravimetric data, interpreted with 2 1/2 D modelling, have a shallow carbonate substratum (200 ÷ 400 m b.s.l.) with 2.5 g/cm3 density, overlaid by alluvial and lacustrine deposits interbedded with volcanoclastic rocks with 1.9 g/cm3 density. The carbonatic basin morphology reveals a multicyclic valley modelled during several phases of fluvial downcutting. By integrating these results with the geomorphological and stratigraphic analysis, the main phases of the Quaternary geomorphological evolution of the study area have been outlined. In particular, it has been pointed out that an initial period of uplift was followed by subsidence, the latter leading to overflooding and burial of fluvial and karstic morphologies. The study has shown that following a period of base level stability that allowed the development of a landscape characterized by low relief, valley deepening due to uplift of the overall catchment area took place during the Lower Pleistocene. The uplift was not continous since both the multicyclic origin of the buried valley and the existence of at least two orders of strath terraces along the slopes testify that phases of downcutting and of base level stability alterned. After the Lower Pleistocene, a major change in the tectonic behaviour of the whole area took place. During the Middle and Upper Pleistoocene the area underwent subsidence and valley filling. The filling (whose thikness is at least 150 m) was carried out first by lacustrine sedimentation, and than by volcanoclastic and fluvial aggradation. The depth of the buried thalweg (down to 400 m below sea level) is much higher than the glacioeustatic sea level low stands occurred during the «glacial» Pleistocene so that a strong subsidence (at least 280 m) is required in order to justify the present position of the valley floor.